The Magic Jeti Switch makes it possible to switch any PowerBox on and off from the transmitter. It forms the ideal complement to any PowerBox system which is installed in an inaccessible location, or in a model where an external switch is not desirable. 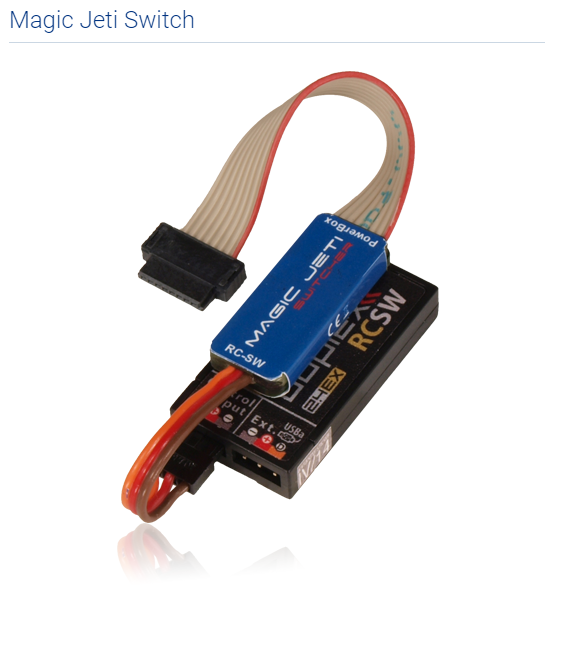 The Magic Jeti Switch is stuck to the Jeti RCSW and connected to it, producing a compact, wireless switching unit which takes the switching signal from the Jeti RC-Switch and “translates” it for the PowerBox. At the transmitter the switching process can be triggered using any switch, and confirmed on-screen with a button. This procedure eliminates the possibility of switching the model off accidentally. You can also set audible confirmation for the switching process by means of an audio file (download in our forum). 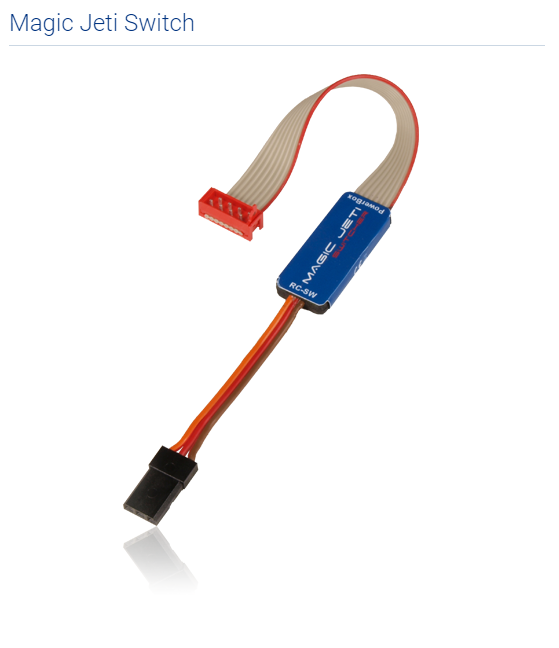 The combination of Jeti RCSW and Magic Jeti Switch draws a very low idle current (< 200 µA), but nevertheless we recommend that you disconnect the switch from the PowerBox if flying is unlikely for a protracted period, e.g. over the Winter. The Magic Jeti Switch is available in two versions: one is fitted with a red plug, and is suitable for the BaseLog, Evolution, Competition and Cockpit; the other with a black plug, suitable for the Royal SRS and Champion SRS.